Roads have stories. Thao’s story involves an ordinary road on an ordinary journey to school on the back of her brother’s motorcycle in Ho Chi Minh, Vietnam. Suddenly the ordinary day became extraordinary in the worst possible way: she was thrown from the motorcycle when a drunk driver crashed into them. The impact caused them to fly into a barbed-wire fence. Thao was knocked unconscious and was rushed to hospital. 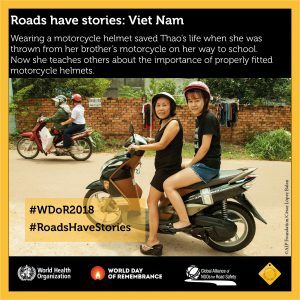 Fortunately, Thao was wearing a motorcycle helmet, which she received through a school-based helmet safety education program implemented by NGO AIP Foundation. According to Thao’s doctor, if she had not been wearing her helmet, she might have died. 78% of motorcyclist fatalities are due to head injuries and wearing a quality helmet reduces the wearer’s risk of death by 42% and serious injury by 69% when involved in a crash. The helmet was good quality and met the Vietnamese government’s standards. When her head hit the road, the foam cushion in the helmet absorbed the impact and protected her brain. Its hard shell skidded on the sidewalk, preventing her neck from damage. The crash changed Thao’s life. After recovering, she became an ambassador for the helmet education program that had provided the helmet that protected her. She has shared her story with students and parents at primary schools throughout Ho Chi Minh City. During her talks, she emphasizes the risks of wearing a substandard helmet and how the quality of hers saved her life. It is estimated that only 19% of helmets in Vietnam meet these standards. At schools where she has shared her message, there have been dramatic increases in helmet use rates. Her story has also touched her friends, relatives and neighbours, and encouraged them to wear helmets. “I would like to become a primary school teacher in the future, not only to transfer knowledge to students, but also to teach them valuable life skills so they can protect themselves from danger – especially to stay safe on the roads,” says Thao. Read more about Thao’s story in Head First: A Case Study of Vietnam’s Motorcycle Helmet Campaign and more about AIP Foundation HERE.